It might seem counterintuitive to head to a cold climate during the winter, but I found lots of reasons to visit Finland while the snow still blankets the ground. One of the most exciting? Reindeer racing. The air was crisp and cold, causing me to shuffle my feet a bit to keep the blood flowing. I had a prime spot behind the barrier on the main street in Rovaniemi, Finland and I wasn’t giving up just because of a bit of chilly weather. I had arrived in the town, the capital of Lapland in northern Finland, around noon and had gone for a wander after ditching my bags at the hotel. I was making my way to the frozen Kemijoki River when I spied what looked like, from a distance…cows? Deer? Very small elk? When I reached the banks of the river, I realized what the shy, skittish animals were: reindeer. They were tethered to the trees with their handlers nearby; later, I found out that their antlers were cut off to reduce the risk of injury (to both themselves and their racers) during competitions. By sheer luck, I’d arrived in time to see the finals for Finland’s reindeer races. 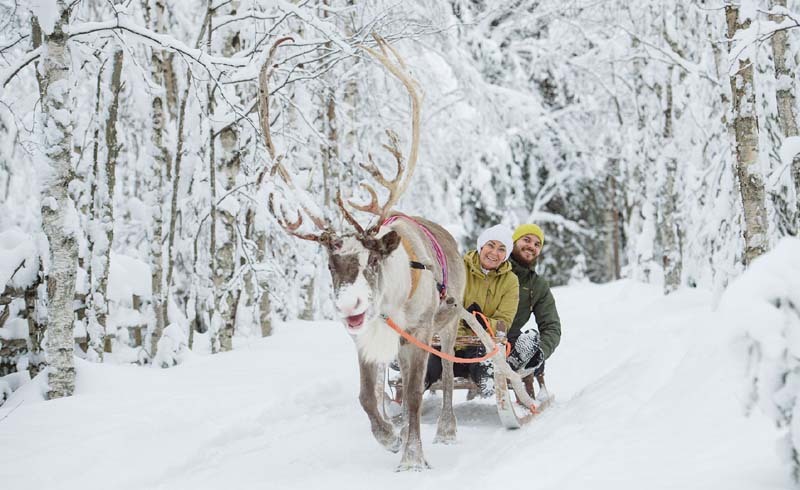 Reindeer racing is just one of the highlights of visiting northern Finland in the winter. 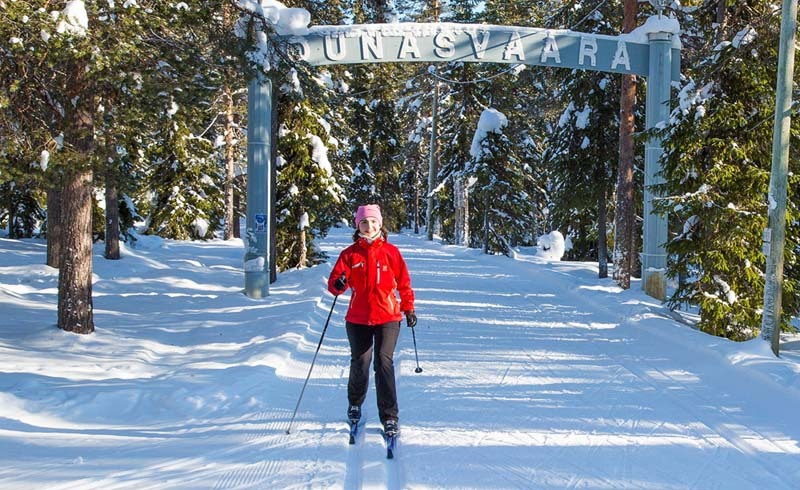 Lapland is the northernmost province, and Rovaniemi is situated just a few miles south of the Arctic Circle. I visited in late March, and while snow still blanketed the ground and I had packed my duffel with many warm clothes, the sun was bright, making it feel warmer than the 30 to 40-degree weather. Though there are several museums worth visiting to explore the local culture, like the museum and arctic science center Arktikum and Korundi House of Culture, I was there for the outdoor activities. Lapland is rich with culture, including plenty of opportunities for animal interactions, like dog sledding and reindeer sleigh rides. There are snowmobile tours for those who like motors, and cross-country and snowshoe tours for those who prefer self-propelled adventures. Then there’s Santa. Rovaniemi is the Official Hometown of Santa Claus and the Santa Claus Village is worth a visit no matter how old you are. Yes, it’s kitschy. But there’s also something magical about seeing the thousands of letters sent to Santa each year, and you can send your own from their special post office. You can also have a picture made with the official “Arctic Circle” sign (if you’re into that), buy plenty of souvenirs (you may need to pack an extra bag to hold all those purchases), and spend a few minutes with the big guy. Yep, Santa is in residence year-round and the magic man is happy to ask you if you’ve been naughty or nice while your visit is broadcast on a special Santa channel. He was just as comfortable conversing in Japanese and German based on the folks who talked with him before and after me in line, so I had no trouble pre-ordering a few goodies to land under my tree nine months later. There are also opportunities for reindeer sleigh rides through the woods and/or photo ops with these photogenic animals. Note that the reindeer that pull the sleigh are different than the ones who race. The sleigh ride was a pleasant, easy ride through the trees. Back on Koskikatu, the reindeer were running full out, pulling Lycra-clad jockeys that reminded me of downhill ski racers, but on cross-country skis. Two pairs compete head-to-head, often with one reindeer winning by a nose, in a bracket situation. The racers came from all over Finland, having won preliminary races earlier in the season; we were witnessing the best of the best. It was thrilling and so much fun to watch, especially since it looked as if the reindeer were grinning while they ran. One of the main draws to Rovaniemi happens after the sun goes down. Though it’s impossible to predict whether or not the Aurora Borealis will be on display, Rovaniemi’s location means that the chance of seeing the Northern Lights is better here. After being bundled into a giant down-filled coverall and shoving my feet into sturdy boots (both provided by my tour company), I boarded a bus along with about 35 other people to chase down the Lights. It wasn’t quite the serene and peaceful sight I experienced when I saw them in the middle of nowhere Iceland, by myself, but it was possible to separate from the crowd and watch the show. Plus, I met a new friend who shared his shots as I’d rather watch the show than try and photograph it. As I cozied up in my cozy bed at the Arctic TreeHouse Hotel (I’d splurged for the last night of my visit for the chance to see the Northern Lights under the comfort of my duvet), I thought about the wisdom of leaving one snowy landscape ( Colorado) for another in Finland. I remembered the laughter and exhilaration of watching the races, relaxing in a sauna earlier that evening, and the awe while watching the Aurora Borealis. Sure, it required packing more layers, but the end experience was totally worth it. Have you had an incredible adventure somewhere in the world? Let us know your favorite destinations in the comments below!